Lou "Dr. Devastation" Martin riles up a crowd at a Keystone State Wrestling Alliance event. Many of the group's proceeds go to benefit children in Allegheny County. Seven wrestling matches with titles on the line. A strong-arming visitor from Moscow. An "ambulance match" in which two wrestlers will go head-to-head until someone leaves in ambulance. It sounds like the recipe for a WWE pay-per-view event, but it’s actually a local independent wrestling showcase. The Keystone State Wrestling Alliance (KSWA) is teaming up with Blue Dust of Homestead for a community event called Brawl Under the Bridge II. For its second year, Zero Fossil, KSWA and Blue Dust will join together for a solar-powered wrestling match and community gathering. The KSWA is an independent wrestling organization based primarily out of Lawrenceville. Its members have performed around the city since the early 2000s. Lou Martin, also known as his wrestling persona “Dr. Devastation,” was one of their original wrestlers. 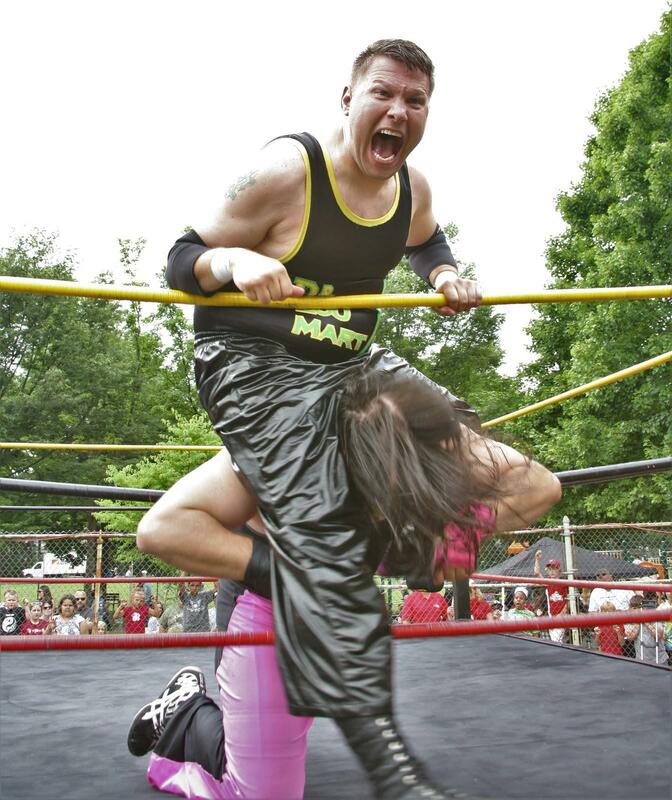 Lou "Dr. Devastation" Martin is tackled by a KSWA opponent. He said he may be a bad guy inside the ring, but emphasized the good work of KSWA outside the ring. In addition to raising funds for causes and organizations such as United Way, cystic fibrosis research, volunteer fire departments and the local food bank, KSWA hosts a yearly winter event for local children. All those toys stay in Allegheny County when they are distributed. Martin also stressed how important it is to KSWA that their events be for all ages and affordable. “Our wrestling is PG-13 at worst, so we try to keep all of our events family friendly,” said Martin. The upcoming Brawl, for example, is $5 and will feature food trucks, family activities and craft beer carts. The Brawl Under the Bridge II will take place in Homestead under the Homestead Grays Bridge. One of the event sponsors is a local company, Zero Fossil Energy Outfitters, who make it possible for the event to run entirely on clean solar energy. While local indie wrestlers are the main players, high profile guest Nikolai Volkoff of the World Wrestling Federation will be appearing. Volkoff has not been to Pittsburgh for quite some time, so KSWA is excited to host him in a six-man tag match (three-on-three wrestling). The event will take place on July 23, with bell time at 7 p.m.
Martin said he is always encouraged by the number of viewers who come for matches. “If we can get folks to one KSWA event, we can get them to come back,” said Martin. More EP Archives can be heard here. here. Since 1922, 29 champions of the National Marbles Championship in Wildwood, N.J. have been from Allegheny County. This year, four mibsters, or marble shooters, from the county will compete in hopes of becoming the next champions. Eli Murphy, 13, resides in Squirrel Hill but practices at St. Michael’s Street on the South Side Slopes with South Side resident Lauren Shuty, 12. Shuty is the Allegheny County Champion. Allegheny County Champion Bobby Narr, 13, and Madison Johnson, 12, practice together in Lawrenceville. For the first time, roller derby will be included in the Amateur Athletic Union Junior Olympic Games. Four junior derby athletes who skate locally for the Pittsburgh Derby Brats will participate in this historic inclusion.